Good morning! Daniel and I had an early start this morning. We’re heading to San Diego today because we need to drop off my beloved Subaru at the San Diego port to ship it to Hawaii. If you dont drive a Subaru, you should really reconsider, and Subaru should hire me as a spokesperson … just saying. 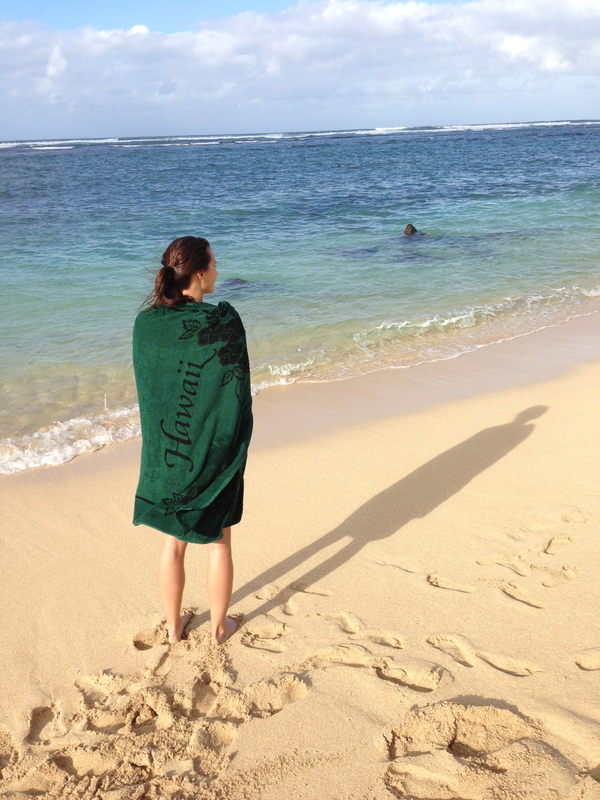 Anyway, we are moving to Hawaii in just a couple weeks for Daniel’s job as an officer in the US Army – Happy Veteran’s Holiday, by the way!! So back to the road trip. The alarm went off at 5:00am and we hit snooze, of course. But don’t worry, only once. At 5:08 we got out from under the covers and since it dropped to 29 degrees it was freezing in the house! Daniel went straight to the kitchen, as he does every morning, to boil some water for our coffee. Yes, we are coffee snobs. We press it, and there isn’t anything better. 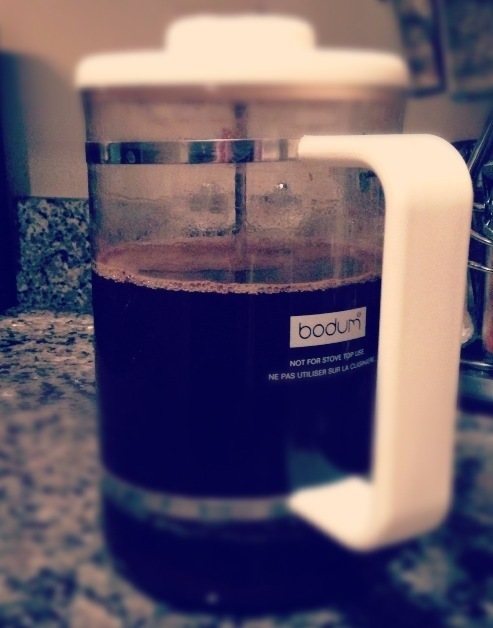 We drink a LOT of coffee so the 12 cup Bodium press allows each of us two generous pours plus one normal person cup. I am very particular about my morning ritual. The most important part of the whole equation is the temperature… HOT. No lukewarm coffee for me. That’s why my routine involves the microwave. If you don’t have a personal little barista steaming your milk, then you use the microwave. I heat my milk for about one minute – historically it has been nonfat milk, but I’m experimenting with 1% now after reading several articles about the myths of skim milk. Recent studies suggest that milk with at least a little milk fat has more healthy (and slimming) benefits than nonfat milk. I’m not saying go out and buy whole milk or start sucking down half&half, but stop worrying if you perfer your latte with 2% milk: just try ordering a tall instead of a venti and skip (or at least cut back) on the sugary syrups. My sweetener of choice – Splenda!! I love it. And a little goes a long way. Just one Splenda packet per 8-10oz cup of coffee is all it takes for me to zap any bitterness of black coffee. When Splenda isn’t available, I usually skip sweetener altogether. I just can’t get into sweet ‘n’ low or equal. And real sugar … I’d rather eat my sugar. In the form of marshmallows, please. Daniel and I differ on the topic of “doctoring up” our coffees. He puts cold half&half and real sugar. The only good thing about this is that I never have to share my delicious cup of coffee. So, how do you like your coffee? … or tea, if you must. Hi! I didn’t know you guys were shipping off to Hawaii! They will have some excellent coffee there 🙂 Ali’s friend is from the Big Island and his mom brings us coffee when she comes to the mainland. Cheers to your new adventure! Hey Shannon! We are really looking forward to what’s ahead. Neither of us have ever been to Hawaii. I can’t wait to get my hands on some island coffee. I hear coffee (and milk) come at a steep price, but totally worth it! We might just eat ramen every night. Thanks for reading!